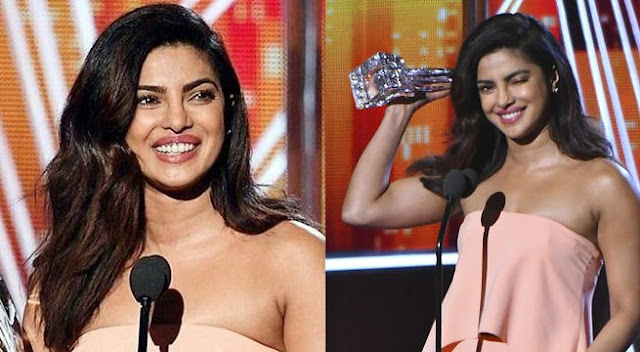 The drama queen of Bollywood, Priyanka Chopra won her second People’s Choice Award for Quantico along with the red carpet on Wednesday. Chopra has also beaten her ABC counterparts Ellen Pompeo, Kerry Washington, Taraji P. Henson, and Viola Davis to win in Favourite Dramatic TV Actress award. She dressed in a peach ensemble by Sally LaPointe for the event. As she was very happy with the nomination she decided to come despite of little illness. During shooting of Quantico she got injured and was in complete rest. “According to the doctor within a couple of days I will be completely fine”, said Priyanka. Priyanka Chopra was overwhelmed and thanked her fans for constant support and love, which motivated her to come.